Greetings from Chicago! My name is Kate Criswell and I am a graduate student at the University of Chicago, working with Dr. Mike Coates on axial column evolution and development in fishes. I just finished up a five-week visit, sponsored by the Development Travelling Fellowship, to the University of Cambridge to work with Dr. Andrew Gillis on skate axial patterning. As a paleontologist by training, I am interested in using fossils to study ancestral conditions and independent evolution in the vertebral column. I began my PhD by examining a broad range of both extinct and extant fish skeletons, looking for similarities and differences in vertebral morphology and structure. After reconstructing ancestral conditions for vertebral characters on a phylogeny, I discovered that many components of the axial column complex, including vertebral centra, evolved independently numerous times in different groups of jawed vertebrates. My research has recently shifted to focus on development: I want to know if distinct lineages of fish (as well as tetrapods) use the same developmental mechanisms to build their vertebrae, and which of these mechanisms are conserved across all jawed vertebrates. 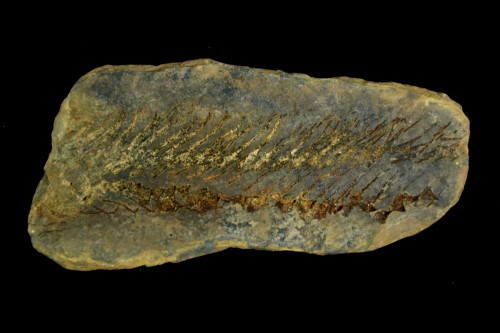 An example of a fossil shark, Xenacanthus (NMS 1891.41.6.B), with a preserved vertebral column. Most of what we know about vertebral development comes from several well-studied vertebrate systems: chick, mouse, zebrafish, and medaka. Vertebrae typically form from a migration of sclerotomal cells that encircle the notochord and condense to form vertebral elements. Because most of the current knowledge on vertebral development comes from osteichthyans, or bony vertebrates, these taxa give an incomplete view of vertebral column evolution. I am focusing my research on chondrichthyans, or cartilaginous fishes, because they occupy a key phylogenetic position as the most proximate outgroup to osteichthyans and can provide an additional, crucial dataset. I am using the little skate, Leucoraja erinacea, to fate map the ventral part of the somite, to determine where in the vertebrae sclerotomal cells eventually end up, and to study the expression patterns of genes known to be involved in vertebral patterning. I obtain little skate embryos from the Marine Biological Laboratory (MBL) in Woods Hole, Massachusetts. They are one of the fastest-developing chondrichthyans (~5 months from fertilization to hatching at summer temperatures!). The females lay two egg cases at a time, and will lay eggs year-round. To do the fate mapping experiments I cut windows in the egg cases and move the embryos to a petri dish, where I inject them with DiI. I then scoop them back up, deposit them back in the egg cases, and let them develop for two months. While in Cambridge I learned several useful techniques: embedding and sectioning skate tissue to analyze data from somite fate mapping experiments that were started in the summer, staining with Haematoxylin and Eosin, and making probes and doing in situ hybridizations for several sclerotome markers. 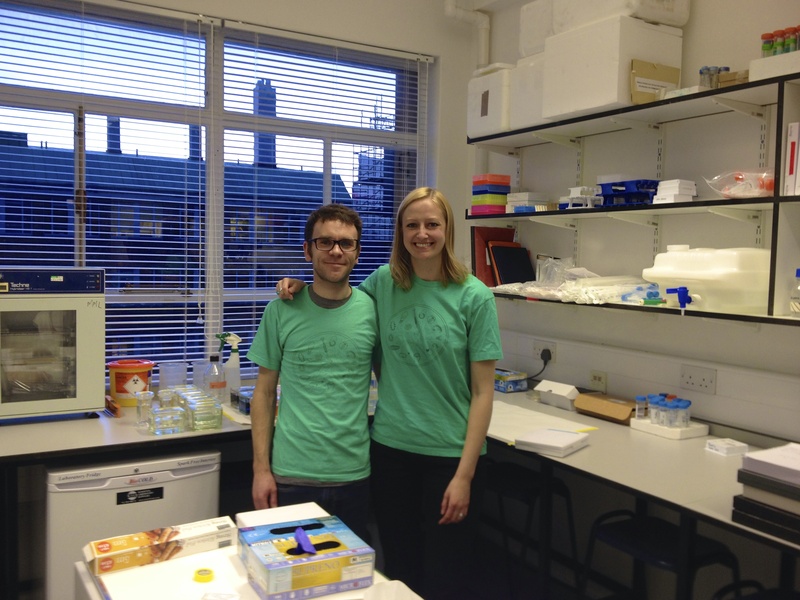 Because Andrew just recently began working at Cambridge, he didn’t have all of the necessary sectioning equipment set up yet. Luckily, I was able to use the microtome and vibratome in Dr. Clare Baker’s lab, which allowed me to meet and get to know even more wonderful scientists. This meant that I was dashing back and forth between the Zoology building and the department of Physiology, Development, and Neuroscience, but it was all worth it for the skills I learned. 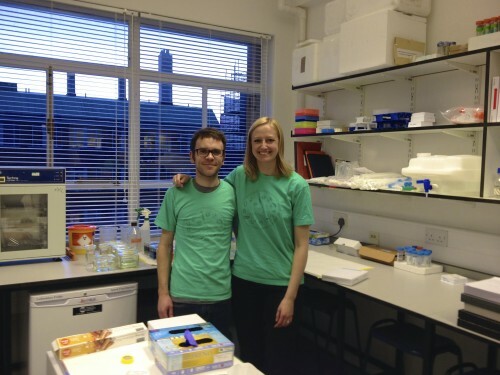 Andrew and I in his lab in the Zoology building. I used my weekends to explore some of the cultural aspects of Cambridge, visiting the Sedgwick Museum (earth sciences), the Fitzwilliam Museum (art and archaeology), and some of the beautiful colleges (King’s, Trinity, and St. John’s). I am very grateful for the opportunity to learn from such enthusiastic and knowledgeable scientists and really get to know a new city and university. 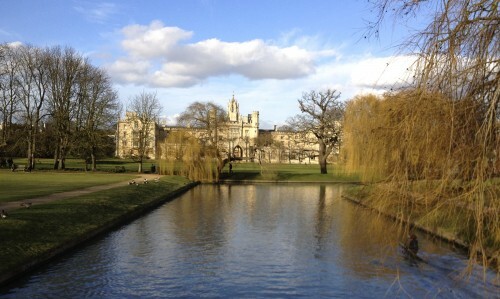 Just one of the lovely views of Cambridge – St. John’s College. The next deadline to apply for a Development Travelling Fellowship is the 30th of April!